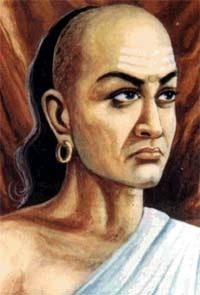 Chanakya was a political adviser and writer during 350BC-275BC under the rule of Chandragupta Maurya. He is known for his political treaties called the Arthashastra and Neetishastra written under his pen name of Kautilya and Vishnugupta. Even today the name Chanakya is synonym with strategy. While the Arthashastra discusses economics, welfare, war strategies and international relations; the Neetishashtra discusses the ideal way of life and behavioral science. Both the treaties are often referred to while teaching management principles. A person should not be too honest. Straight trees are cut first and Honest people are victimized first. Before you start some work, always ask yourself three questions - (a) Why am I doing it, (b) What the results might be and (c) Will I be successful. Only when you think deeply and find satisfactory answers to these questions, go ahead. Whores don't live in company of poor men, citizens never support a weak company and birds don't build nests on a tree that doesn't bear fruits. Once you start working on something, don't be afraid of failure and don't abandon it. People who work sincerely are the happiest. Treat your kid like a darling for the first five years. For the next five years, scold them. By the time they turn sixteen, treat them like a friend... Your grown up children are your best friends. Chanakya's writings are quite comprehensive and relevant even today. They only need to be adapted for modern times. Chanakya had proposed that one sixth of value of produce should go to the State- one would be surprised to know that even today the Government of India charges 16 % which is approximately onesixth. !